F&W’s guide to Hong Kong restaurants features spectacular supper clubs— like Da Ping Huo, where one of the chefs finishes each night by singing Chinese opera in the dining room—the best and cheapest dim sum in the world, dazzling fine-dining and designer cocktail bars. Private supper clubs, vastly popular in Hong Kong, usually serve homespun Sichuan and Cantonese food. 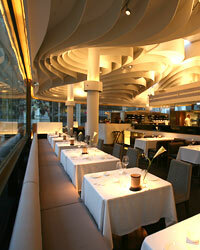 But Liberty Private Works elevated the genre in 2009 by preparing ambitious tasting menus. Daniel Boulud-trained chef Vicky Cheng cooks the 10-course, Japanese-inflected French meals, which might include farmed big-eye tuna with house-made espelette pepper mayo, puffed sushi rice (dehydrated, then fried) and sea urchin. With only 26 stools around an open kitchen and two seatings a night, it is one of the toughest reservations in town. libertypw.com Photo courtesy of TBLS Kitchen Studio. 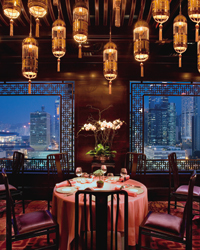 This restaurant at the Four Seasons Hong Kong is one of the city’s most dazzling, adorned with colossal crystal chandeliers, dark red banquettes and floor-to-ceiling views of Victoria Harbour and the Kowloon Peninsula. Chef Vincent Thierry and his kitchen staff of 25 work in an open kitchen, creating contemporary dishes with clever, multiethnic components, like the Brittany lobster with sweet potato, kumquat marmalade and tagliarini in a sauce flavored with Thai black tea. The massive cheese table, arguably the city’s best, is stocked each night with dozens of rare selections from the restaurant’s temperature- and humidity-controlled cave. fourseasons.com © Swire Hotels. At this minimalist, white-tablecloth restaurant in on the 38th floor of the Hotel Panorama in Kowloon, young American chef Mike Boyle, who cooked under Thomas Keller at Bouchon in Las Vegas, presents each of his dishes with showy spectacle: His smoked Atlantic salmon comes with a side of goat cheese “snow”; a layered lobster, crab and avocado salad arrives in a globe of ice; and desserts like the rosewater-and-raspberry ice cream are prepared tableside with liquid nitrogen. hotelpanorama.com.hk Photo courtesy of Four Seasons, Hong Kong/Markus Gortz. Once only known by a select group of serious foodies, one of Hong Kong’s most famed private supper clubs (known as “private kitchens”) is now accessible to anyone with the phone number—though the door is still unmarked. Husband-and-wife team Wang Hai and Wong Xiaoqiong serve 12-course set menus of classic Sichuan dishes like jellyfish in spicy chile oil, Ma Po tofu and Sichuan dumplings. 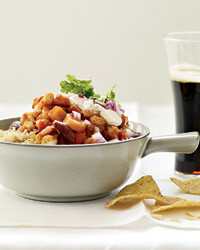 They make no concessions for the uninitiated: Dishes are as fiery as ever. An unexpected touch: Xiaoqiong comes out of the kitchen at the end of each evening to sing Chinese opera. This nondescript-looking dim sum parlor is the cheapest Michelin-starred restaurant in the world. Dim sum master Mak Pui Gor used to work at the Four Seasons’ Lung King Heen; now with his own place, he serves his exquisite versions of traditional dim sum—crisp, crumbly char siu bao (fragrant bread stuffed with rich pork); superdelicate rice rolls filled with shrimp; steamed chicken feet glistening with black bean sauce—for about $2 a basket. Expect lines of an hour or more. Central’s Wellington Street is known for having two terrific Hong Kong Cantonese noodle houses practically across the road from each other: Mak’s and Tsim Chai Kee. While traditionalists swear by Mak’s, the latter holds the edge with its firmer, larger wontons; chewier noodles; superflavorful, slightly sweeter broth; and excellent beef brisket. Mixologist Masayuki Uchida, formerly at Oriental Sake Bar Yu-Zen, has struck out on his own with this dark, handsome bar in Kowloon. Always clad in a spotless white dinner jacket and black bow tie, he meticulously mixes cocktails with fresh-squeezed juices and pours them over hand-chipped ice in Baccarat crystal glasses. Butler’s 200-plus liquor collection includes rare whiskeys from Japan and Scotland as well as more esoteric bottles like perilla liqueur. Photo courtesy of Lily and Bloom. 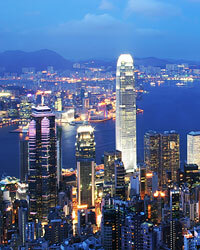 Will Hong Kong Drink Up All Our Wine?